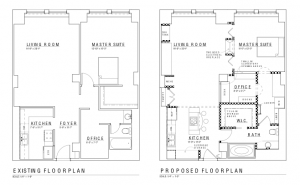 Featured Homes - Stanton Architects, Inc.
A 20th century Chicago condominium needed to be moved into the current century. The clients asked for an open floor plan, a more user-friendly kitchen, a larger bathroom, a new laundry room, and a highly functional office, all with chic modern architectural elements. Full-height walls were taken down and redesigned with two different height room separations opening up the space. The narrow foyer was removed enlarging the kitchen and a pantry was added to the open redesign. Niches and a two-sided fireplace add interest in the living room. A walk-through bathroom was given additional square footage. A convenient laundry room was located between the bathroom and bedroom. An office was centrally located and given plenty of work area, storage shelves, and plenty of wall space for multiple screens. For Andrew and Kathy Dorich, preserving their home’s history is a passion. 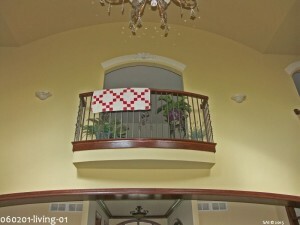 They have been enjoying their charming 1925 Cotswold house in Joliet, Illinois for over 30 years. Cotswold is also known as “Storybook style” or “Tudor cottage.” Our recent second story addition restored an already wonderful family home to its original glory and then some. 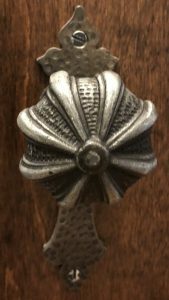 Andrew and Kathy came to me because they realized an architect was the best way to achieve the seamless antique feel they desired. After a friend’s referral and our plans drawn up, they felt most comfortable working with Stanton Architects, Inc. They knew that hiring a design/build firm would carry the original design through construction. The project called for a master suite built above the great room in the middle of the house; all other rooms were to remain intact. Along with three adopted children, Andrew and Kathy committed to taking care of her elderly father in this new five bedroom, three and a half bath home. Two bedrooms remained on the main floor with three bedrooms upstairs. One way of preserving the Cotswold “flavor” was working around the main winder staircase. Making a winder stair stop, or landing, is against code today. These stairs were grandfathered, however, so we could keep them as long as they were not modified. So, we created a landing and four more risers to the master suite. The heart of the home is the great room. 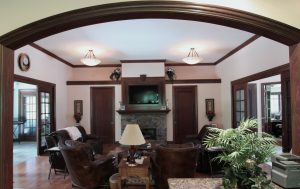 We used a textured plaster on the 12’ ceiling to carefully preserve its ornate beams. A focal point of the great room is the impressive 8’ wide brick floor to ceiling fireplace adorned with French doors on each side. 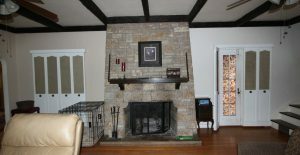 It was important to the family that we maintain the original design of the chimney and fireplace. The final touch was replacing a prior remodel of Colonial doors with custom Miracle doors to match the original. The Paine Lumber Company in Oshkosh, Wisconsin manufactured miracle doors in the early 1900s. They can be found in middle and upper-middle class homes built between 1910-1945. Miracle doors were an innovative single flat panel with stepped layered moldings. Traditional five or six panel doors were common of that era. The couple helped by searching for doorknobs and backplates. 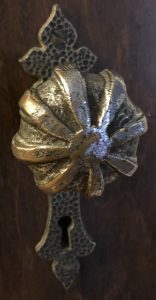 A months long online search for doorknobs found a perfect match in a California antique store. Custom backplates were ordered from an ironworker in Pennsylvania. I appreciated their active partnership. The exterior design, as the interior, stayed true to the home’s 1920s history. Exterior Finish Insulation System, EFIS, instead of the more standard Portland cement, matched the color and texture of the original stucco. As a result, the house reflects the roots of this heavily wooded, historic neighborhood known as Cherry Hill. Ask older folks who live there, and they’ll tell you, “It was the most high-end place to live in the area.” Now, it’s a mix of fixer uppers, modern-day homes that try to fit in, and traditional gingerbread homes. Andrew and Kathy emphasized throughout the process that they wanted to preserve the home and community history. After six months of design and construction, we completed the 582 square foot addition and full restoration. 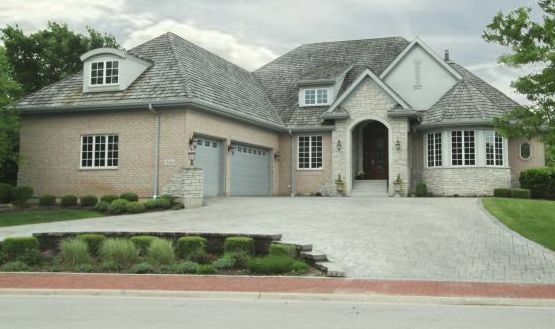 Roofing, stucco, windows, framing and moldings all came together in what I love to call the “Cotswold Jewel of Joliet,” a stunning example of a Storybook home’s original glory revealed! Every nook and cranny of this home is being used. It was a special project for me. I could make a precious jewel out of it, an ornament for this special neighborhood. Stunning woodwork and attention to detail highlight features of this gorgeous home. 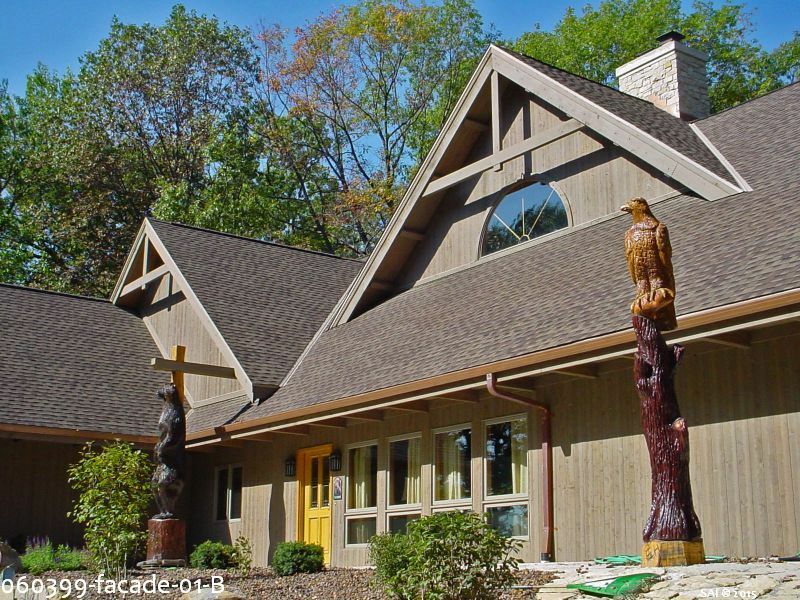 Nestled in a quiet wooded subdivision within Joliet, Illinois, stands this majestic house surrounded by over 150 species of birds and numerous wildlife. Stanton Architects, Inc. worked closely with the owners for a year to build an accessible home for their live-in elderly parents. This home allowed the owners to lovingly nurse and enjoy the remaining years of their parent’s lives and allows the owners to age in place if they choose. Special features include wide hallways, large rooms, and en-suite bathrooms with grab bars, comfort height toilets, walk-in tub, shower spray units, and sinks with knee clearance. The kitchen has a lowered breakfast bar to allow for wheelchairs. Convenient drawers underneath hold medicine and personal items. Two stair lifts transport up/down stairs. 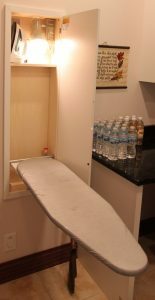 The laundry room has a raised washer/dryer and a work light mounted in a cabinet illuminating the ironing board. Their mother enjoyed ironing and was able to feel productive. “Live in the home of tomorrow…today!” a developer’s billboard reads in the popular 1980’s movie, Back to the Future II. Back to 1955 in Joliet, Illinois, a Mid-Century modern home was built and has recently been listed for sale. In 2004, Stanton Architects, Inc. was commissioned to modernize the kitchen and bathrooms. To keep with the modern design, they stayed true to characteristics from that time: clean lines, innovative use of glass, and a mix of materials. The most prominent change was opening up the kitchen into the living space by tearing down a wall. “Whoa, this is heavy,” says Marty McFly in the movie. 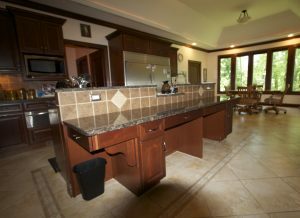 The enclosed kitchen was given two islands, one as a prep station and one as a bar separating the kitchen and living room. 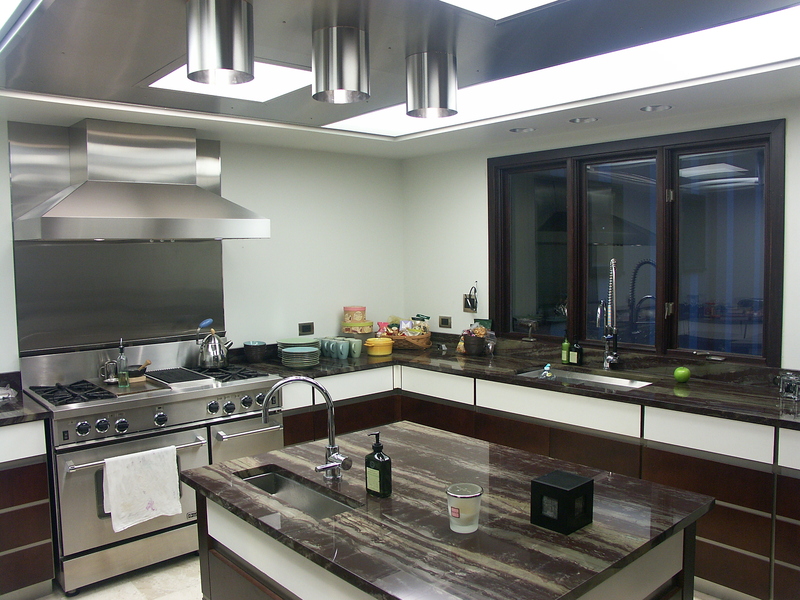 A highlight of the design includes sleek laminate cabinets with glass light box panel doors. Another remarkable feature is the use of custom stainless steel doors and ceiling light boxes with canisters. Stainless steel appliances were selected, another foresight. “One point two one jigowatts!” exclaims Doc Brown, “Great Scott!” Technologically advanced, Stanton Architects, Inc. prepared a computer visualization of the designed kitchen. 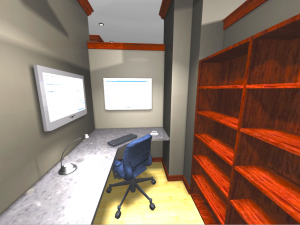 The homeowners experienced a virtual reality, animation, and gallery of the new space allowing them to visualize it in 3D. 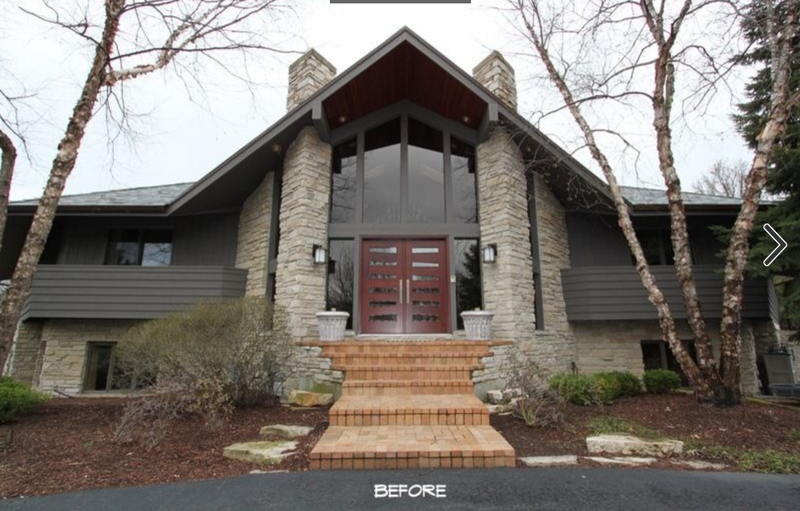 Stanton Architects, Inc. provides this valuable service to allow clients to make building, materials, and color changes before construction starts, thus saving considerable time and money. The master en suite received a “Far out!” makeover also. The cabinets remained in tact while clean stainless steel vessel sinks sat on top of a shiny stainless steel countertop. Raised wall-mount faucets protrude from their own stainless steel counter spilling water into the vessels below. Under cabinet lighting highlights the blue glass tiled backsplash. 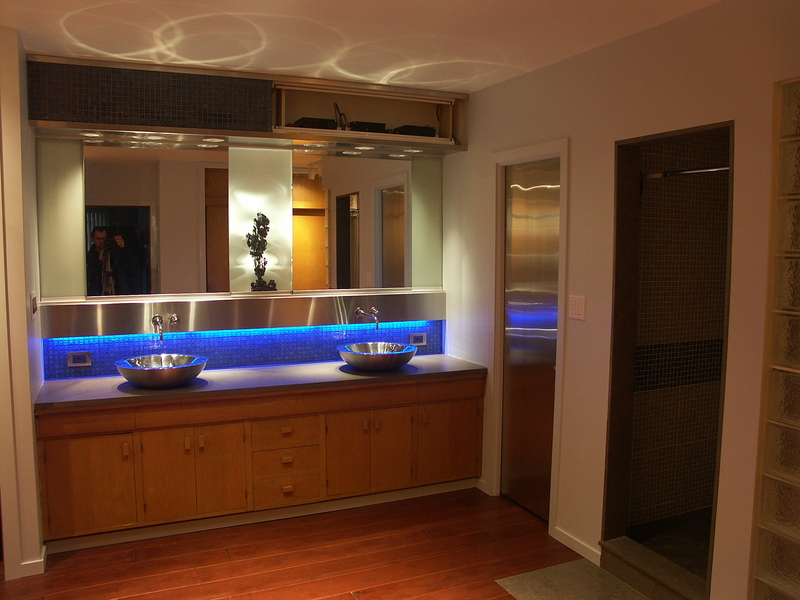 Above the new specialty mirrored medicine cabinets, is another backlit blue glass tiled light panel. A privacy pocket door was added to the water closet. Glass blocks wrapped around the shower corner allow light to flood the shower area. A second bathroom was also brought “into the future.” A water closet was created by the bathroom’s entrance allowing more privacy. Wood and glass front doors create visual interest on the new larger cabinets. Atop are two porcelain vessel sinks and modern wall mount faucets. Light boxes frame the mirrored medicine cabinets all around. The bathroom’s sole window was saved but the tunnel like wall approaching it was taken down and opened up into a unique large bath area designed for showering or bathing. A frameless glass wall separates the bathing area from the dressing area. These modern design inspired renovations kept its Mid-Century modern design style of sleek, clean, simple, and a timeless look for this architectural gem. The new homeowners can live in the future, today! A mirror image of the A-frame facade was incorporated into the new design leading the eye all around the front of the house. Symmetry adds to curb appeal while the trees add an interesting organic twist. Playful stepping stones encourage an almost skipping type feel and demand a choice on which side to go up. The new stone garden walls allow for planters that can change periodically by displaying greenery, colorful flowers, or cascading foliage. These stone garden walls give the illusion of floating steps and landing. Replacing the bright pumpkin orange brick steps with matching Fon-du-lac stone allows the elegant mahogany doors to become a focal point. 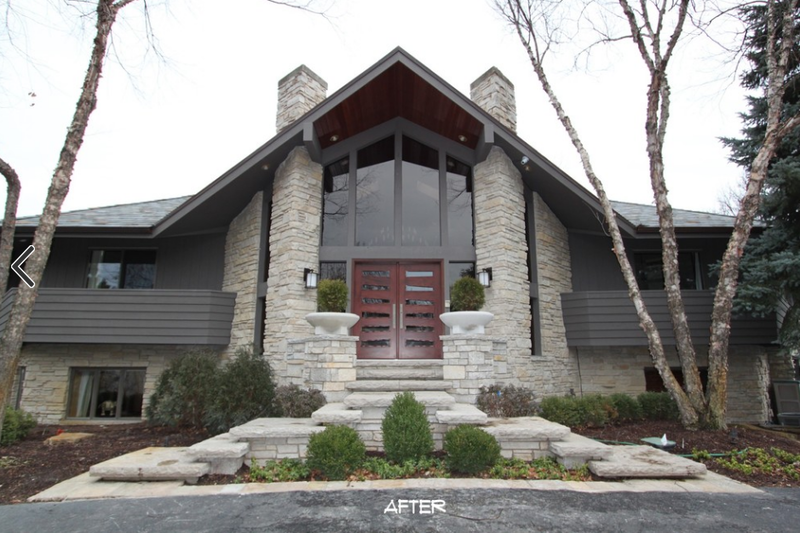 John’s makeover adds drama and curb appeal accentuating the beauty of this home. On a rainy day in June 1999, architect John Stanton had his first meeting with Mr. and Mrs. K at their recently purchased property in Rockdale, Illinois. Hidden in the center of an industrial area in this tiny blue-collar town, the modest 1950’s timber-frame home sat on a beautiful 5-acre wooded lot, just south of Mr. K’s successful manufacturing business. Serendipity had played its part, when one of their employees stumbled across the property for sale and alerted them to its availability. The couple was enamored of the existing home on the property, a charming flat-roofed cottage with tongue-and-groove wood ceilings, large beams, and a brick fireplace. It had only one bedroom, however, and Mr. and Mrs. K were looking to expand substantially. 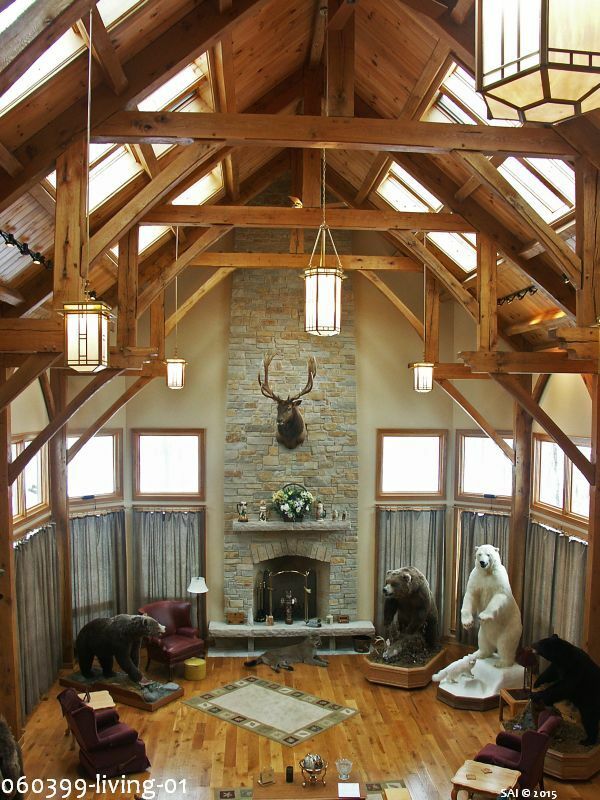 Mr. K happened to be a record-holding big game hunter, and had a vision of a custom home that would become a showplace for entertaining and a veritable museum of Northwest Orient hunting and fishing. Mrs. K, on the other hand, wished for nothing more than a big dining room, a place to hold family gatherings for her three sons and eight grandchildren. With John’s help, they got both, and then some. When Mr. K set about interviewing architects, each one wanted to raze the existing structure and start fresh on the site. John came recommended by a mutual friend, and – unfazed by Mr. K’s reputation for dismissing apparent dupes, conceits, and liars regardless of the circumstances – pragmatically agreed to assess the property and do his best to accommodate the couple’s wishes. Upon further review, John discovered what others had not, that tearing down the existing structure would have caused all kinds of issues with the current zoning laws. 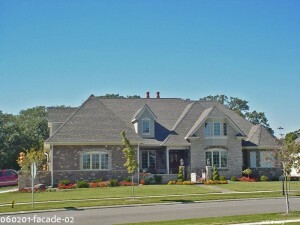 John’s proposed design preserved much of the character, while expanding the home by 300% to include an updated master suite, two additional bedrooms with a shared bath, a large dining room off the kitchen, an open loft, an expanded 2 ½ car garage, and most importantly, a huge great room, incorporating timber frame structures and a floor-to-ceiling stone fireplace, that would serve as both a “Hunter’s Room” for Mr. K’s prizes, and as an entertaining and gathering place for family and friends. As anyone who has built a house before knows, challenges are inevitable, and this unique and expansive project was no exception. John was especially respectful of the original design and character of the existing house. He incorporated the original brick fireplace by underpinning it with new footings and extending it into the new partial basement, where concrete piers were also added to support the timber truss system to be added above. John recalls, “Even though the wood structure was engineered and fabricated by the company, we had to make sure the foundation could support it, and the whole back wall was underpinned in order to create the basement”. French doors alongside the fireplace now open through what used to be an exterior wall, into the new great room. A new mechanical room housing an energy-efficient HVAC system utilizes the backside of the fireplace as one of its walls, and a custom wood-clad switch-back staircase extends from the basement to the new 420-square foot loft. Another obstacle was the 28-ft tall Rumford fireplace in the great room. 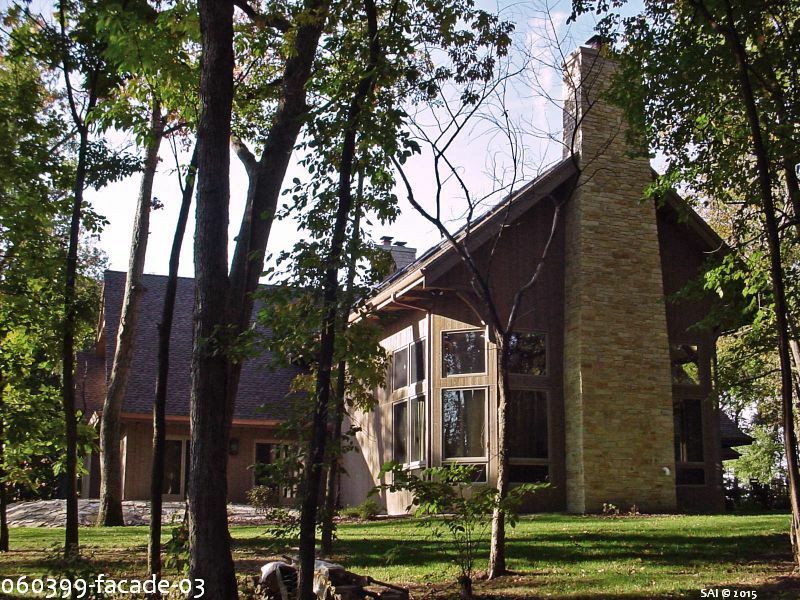 One contractor, unwilling to accommodate the owner’s wishes, was dismissed, and another finally completed the Fon-Du-Lac stonework on the structure. About the differing materials on the two fireplaces, Mrs. K remembers, “Some of the people that gave us pricing on doing the fireplace in here wanted to cover the fireplace in there, and make it all match, and that was one of the things that we did NOT want to do. So that’s why we brought the two together in the kitchen, so you have both the stone and the brick in the kitchen.” This intentional mix of materials so seamlessly integrates old with new in home, that most visitors don’t realize they are seeing two structures in one. Of course, the most impressive feat is the installation of the giant exposed timbers that span the soaring space of the great room. Built with mortise-and-tenon joinery and hand-hewn wooden pegs, the massive support beams were brought in from Tennessee by Hearthstone Homes, and give the entire home a feel of old-world craftsmanship that is rarely seen in today’s construction methods. The dramatic interior space boasts 6-foot tall windows on three sides, with views of the surrounding acreage. John added 32 skylights for additional daylighting, which balance the Craftsman-style stained glass pendants illuminating the space, and rain-sensor technology give the added benefit of managing ventilation. Another engineering marvel within the great room is the curved stairway to the loft, which is clad in a gorgeous rustic character oak. The landing boasts the best views in the house, and nearly every first-time visitor to the home requests permission to take photos from that particular vantage point. Mrs. K compliments the tradesmen who worked on the stairs as being very professional and easy to work with, and then adds, “As far as the landing goes, some of them said, ‘I don’t know about that one’, so Mr. K did that. He and John came up with that, and Mr. K did the landings himself”. 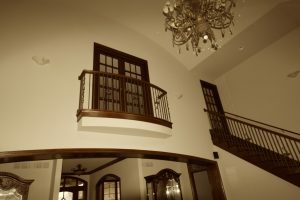 Drawing on his own past experiences with building or remodeling various homes and rental properties, homeowner Mr. K had mastered certain ways of dealing with difficulties, and even experienced architect John admits that he learned some things from Mr. K. Together, they resolved whatever predicaments arose along the way. In working with John, Mrs. K recalls him as being “Always here. I never had to wait for him, or look for him, or not get a call back. He was there”. John’s attention to detail even extended outside, to the underside of the eaves, where the attached cedar boards were spaced out to mimic the original siding. The new wraparound deck is also entirely cedar, and maximizes views of the park-like setting from every angle.